The Economic Margin (EM) Framework was developed by AFG to evaluate corporate performance from an economic cash flow perspective and is an alternative to accounting-based valuation metrics. EM measures the return a company earns above or below its cost of capital and provides a more complete view of a company’s underlying economic vitality. Currently, common measures of corporate performance are based on earnings, such as earnings growth, price to earnings and ROE. Consequently, firms will often undertake actions that increase earnings (and taxes), but do not create value, in the hope of inducing stock analysts upgrades. Such a misplaced importance on the role of earnings is tragic, as earnings are only a part of the shareholder wealth creation process. AFG’s Economic Margin (as opposed to accounting-based methods) has become popular for two reasons. First, capital markets have forced money managers and corporations to have a renewed focus on the balance sheet; these companies are expected to provide an adequate return on the money they have invested. Second, accounting information, although necessary, does not by itself adequately explain market valuations nor provide comparability between firms. Traditional accounting-based valuation methods provide an incomplete view of a company’s value by not accounting for investment to generate the Earnings, Cost of Capital, Inflation or Cash Flow. Our proprietary Economic Margin (EM) was developed to evaluate corporate performance from an economic cash flow perspective. We effectively link the income statement and balance sheet to capture differences in capital structure, Asset Age, Asset Life, Asset Mix, Off Balance Sheet Assets and liabilities, Investment Needed to Generate Earnings and Cost of Capital. 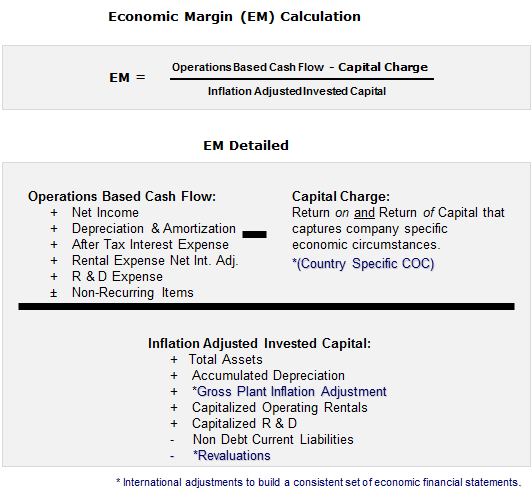 EM is meant to serves two purposes: Create a measure of a company’s economic profitability; that is, did this company generate cash flow in excess of the costs of its capital invested in its operations, or did the company destroy wealth? Once we have solved for this, we can then use this EM as a function in our valuation model. In short, AFG’s Economic Margin evaluates corporate performance by addressing three primary questions. What is the firm’s cash flow? Net Income does not accurately reflect the true cash flow of the firm due to accrual accounting. Inflation distorts historical book value comparisons between peers that capitalized at different times, as well as an understanding of the real value of a firm’s balance sheet assets today. Research & Development costs, which are long term investments in future cash flows, are immediately expensed under GAAP accounting. Operating Leases, obligations which must be paid similar to debt, never appear on company balance sheets. We ultimately want to identify the real value of all invested capital employed by a company instead of simply focusing on historical book value. What are the opportunity costs of capital? Cash Flow vs. Cost of Capital can help better explain economic profitability. Different asset characteristics (life & age) distort comparisons between capital investments and DD&A. Cost of capital defined by size and leverage characteristics more accurately reflect the riskiness of a firm than a beta-driven estimate. Because EM answers these questions and corrects accounting distortions by taking into account Asset Life, Asset Mix, Asset Age, Capital Structure and Growth, effectively linking the income statement and balance sheet, EM levels have a much higher correlation with market Values. By evaluating corporate performance for each company in the FTSE World Index from an Economic Margin perspective, we can clearly see that the market is willing to pay a higher multiple for companies that are generating higher EM’s. Economic Margin is a more complete performance measure for companies to use to guide performance and motivate employees. Executives consider Cash Flow, Investment, Competition & Risk when setting strategy. The above charts show that investors do the same. A company’s performance measure must serve as a proxy for its market value creation. Successful corporations consider cash flow, investment, competition & risk when setting strategy with the goal of creating shareholder value. But not all management teams are successful at creating shareholder value. AFG’s Economic Margin can help investment managers clearly distinguish management teams ability to create shareholder value.